Water gardening is a fun and rewarding, though somewhat seasonal hobby. Every autumn when the days get shorter and the nights get colder, the time comes to prepare your garden pond for the long winter ahead. As the colorful autumn foliage turns to falling leaves, and even the hardy water lilies start to die back from the chill of those first frosty mornings, the plants and fish in your garden pond need a little help to get ready for winter's arrival. The tasks and maintenance chores are not difficult or time consuming, and a little preparation will help your fish and plants to survive through weeks of snow and ice. 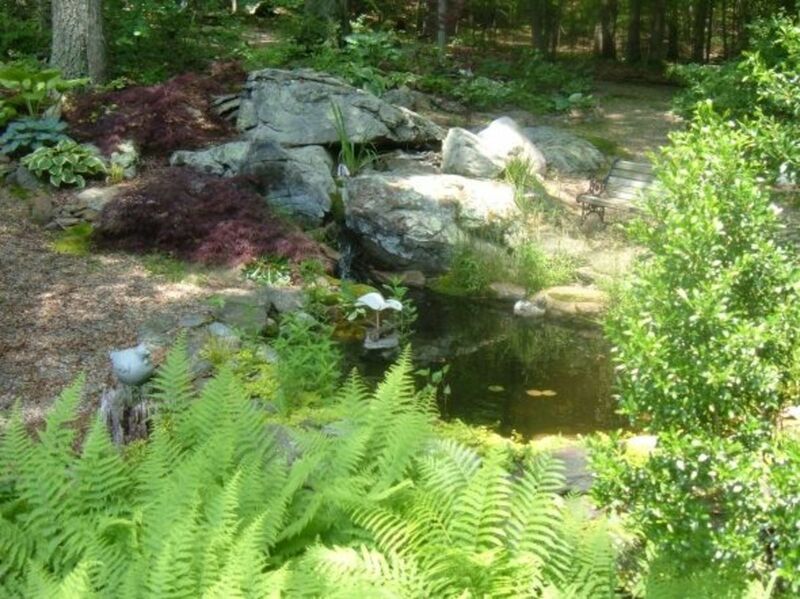 With a little winter pond care in the fall, the plants and fish will be ready to greet you when springs arrives. Below, you'll find detailed reasons and tips for each of these steps. 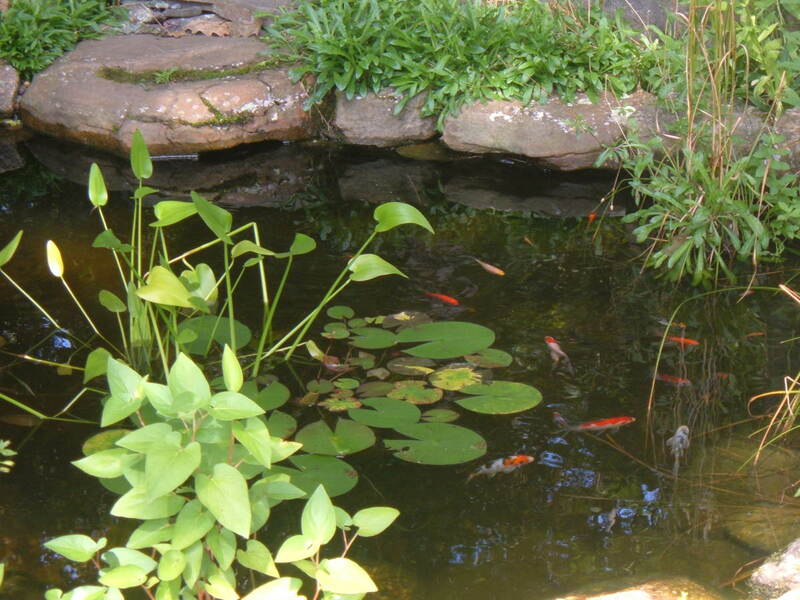 As the temperature of the water begins to cool, stop feeding your pond fish. 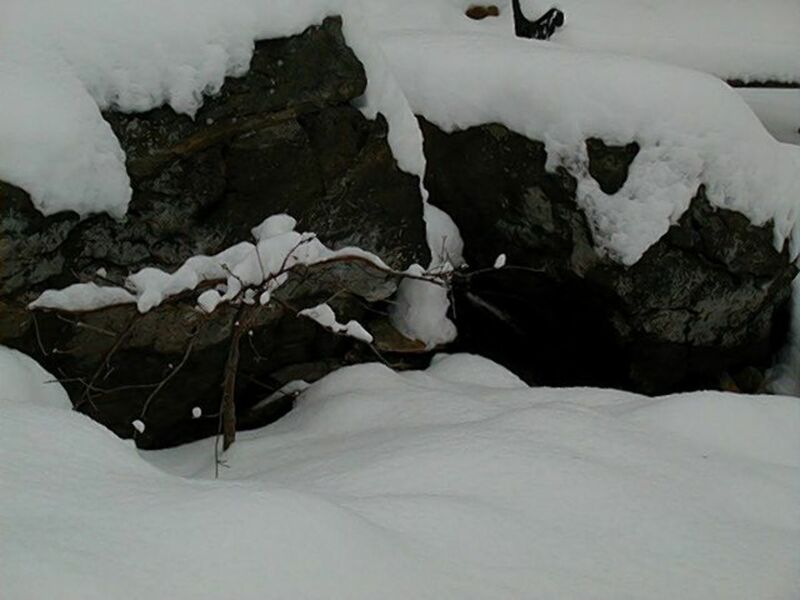 A slower metabolism requires less food, and fish can survive the winter under the ice in a state of semi-hibernation. The koi and goldfish do not actually hibernate but their body functions slow down to the point where they do not expend much energy. As their body metabolisms slow down with the dropping water temperature, the pond fish cannot process food as quickly or as efficiently. Koi and goldfish can withstand the winter cold and the dropping water temperature, but the pond must be at least three feet deep to prevent it from freezing solid. If your pond is shallow and you live in an area where the water will freeze, consider moving your pond fish to an indoor aquarium for the winter. If your pond is shallow and you live in an area where the water will freeze, consider moving your pond fish to an indoor aquarium for the winter. Cut back the dead leaves of the water plants including the water lilies, arrowhead, and any other marginal or potted plants. 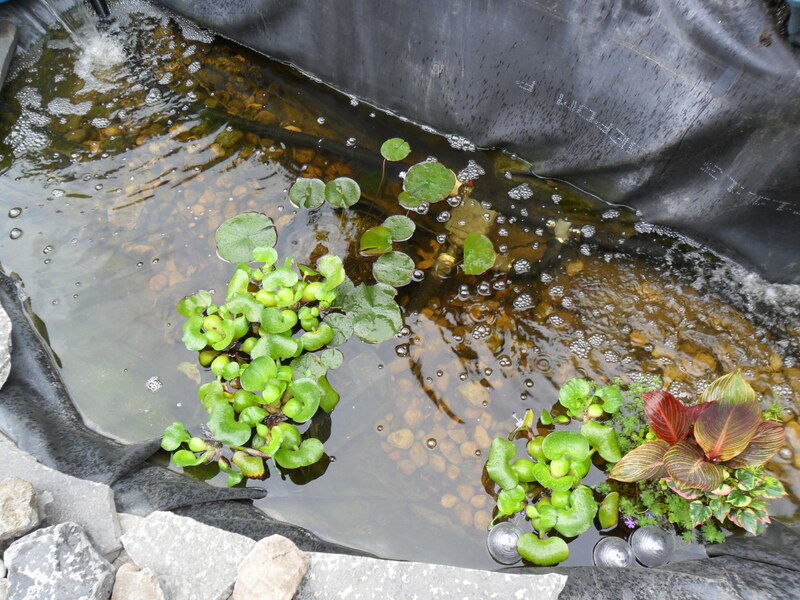 Discard the annuals such as water hyacinths and lettuces, and sink any potted plants to a depth of at least three feet to keep them below the water's freezing zone in the pond. If the pond is not at least three feet deep, winter over the perennial water plants in an unheated garage or basement. Remove the plants from the pond, cut away the dead and dying leaves, and then place the potted plant in a large gallon-size plastic storage bag. With the bag opening facing up, store the plant on a garage or basement shelf. Leave the bag open to allow air circulation, and check the plant periodically over the winter. If the plant begins to dry out, add a little water to keep the root system moist. As spring approaches, move the plant back to the pond. 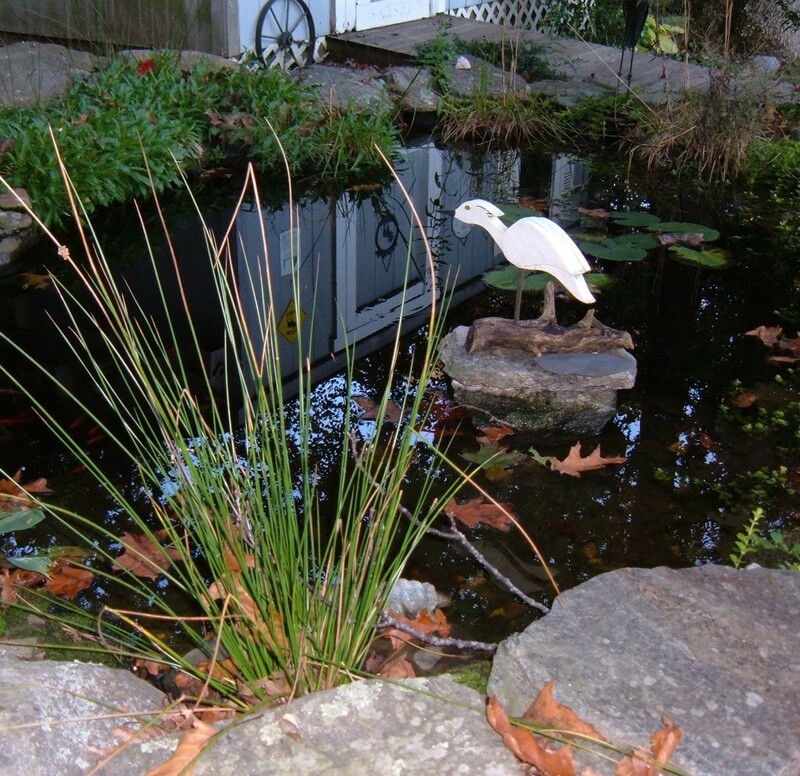 Removing the dead and dying plant matter from the pond helps to minimize the amount of decaying materials left in the water. Depending on the size of you pond, covering the surface area with bird netting will prevent falling leaves from accumulating and sinking to the bottom. Remove any fallen leaves found floating on the surface before they sink to the bottom. As the leaves settle to the bottom of the pond, the decaying material can alter the quality of the water, especially after ice covers the surface. 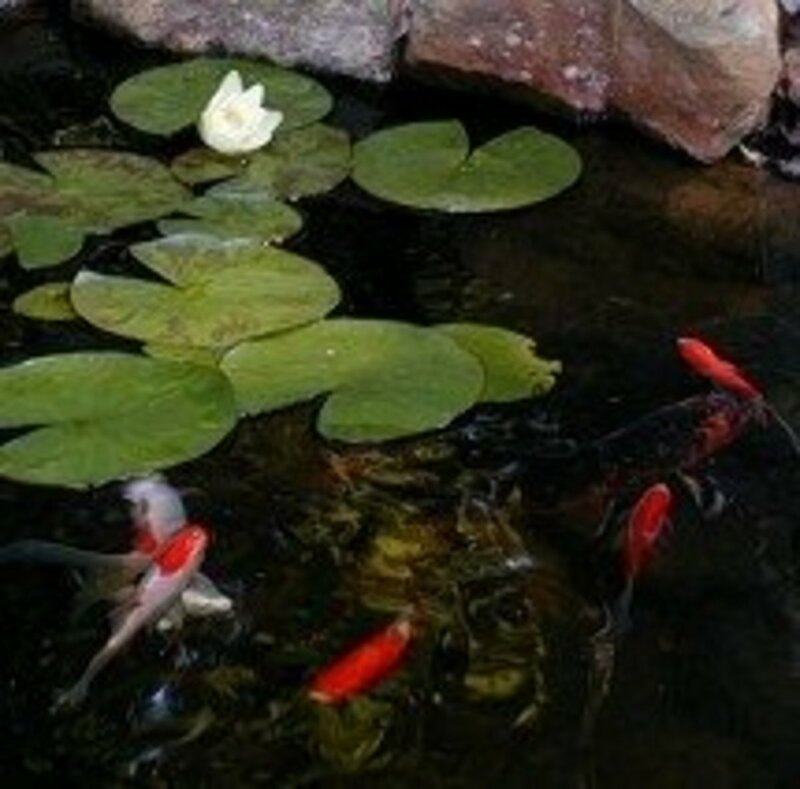 Decaying plant matter depletes the oxygen content, making it difficult for the fish to breathe. Use a plastic spring rake (the kind used to rake leaves from the lawn) or long-handled dip net to remove as many sunken leaves as possible before the ice forms on surface, being careful of the liner, fish and potted plants. If your pond has a skimmer, check the basket often to remove the fallen leaves and other debris. Covering your water garden with high-quality pond netting helps to protect your fish from predators looking for a free meal. As autumn approaches, covering your pond with a net also helps to keep your pond clean by catching falling leaves before they decompose and foul the water quality or clog up pumps. 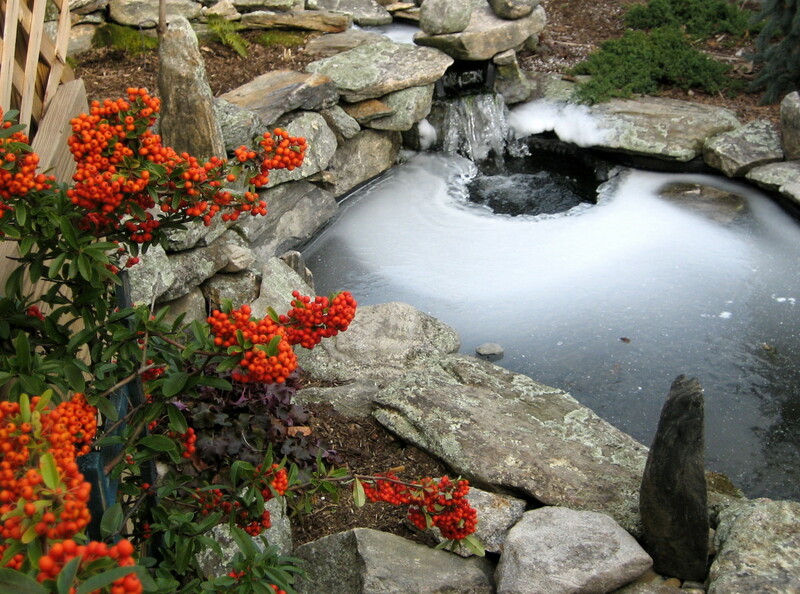 Take the time to winterize your pond's filtration system properly. The exact steps and tasks will varies depending upon the type of filtering system you use. My filtration system uses submerged pump to feed the pond water to a canister style filter, and the outflow from the filter forms the beginning the stream that feeds the waterfall. As winter approaches, I remove the canister filter from its hiding place under a faux rock. A small section of flexible hose replaces the filter, allowing the pump to feed the waterfall directly and keeping the water flowing. Clean the filter completely before storing it for the winter. Take precautions to seal the inflow and outflow ports to the filter. The small opening is very inviting to a mouse looking for a winter home. Pond fish remain active all year. Though their metabolism and body functions have slowed down, they still need freshly oxygenated water to survive. 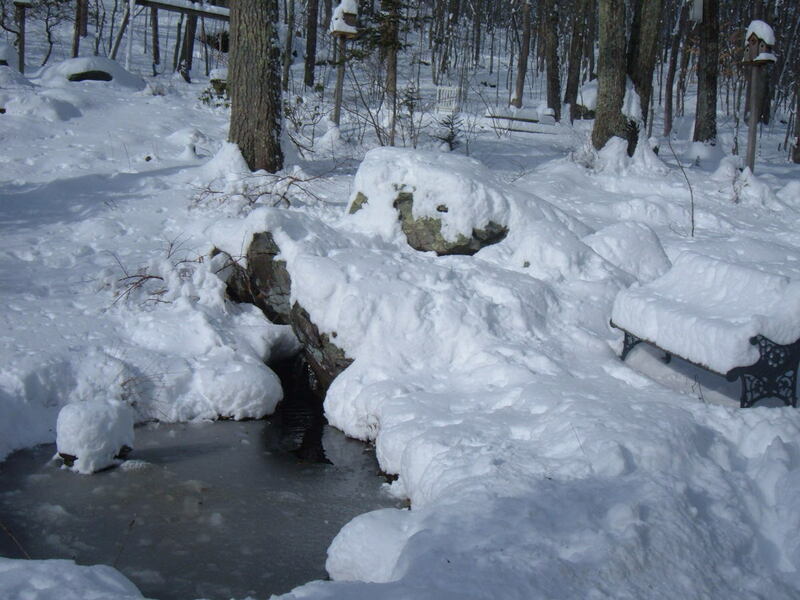 There are several methods to prevent a section of the pond's surface from freezing including adding a pond heater, but I prefer to keep the stream and waterfall running year round. 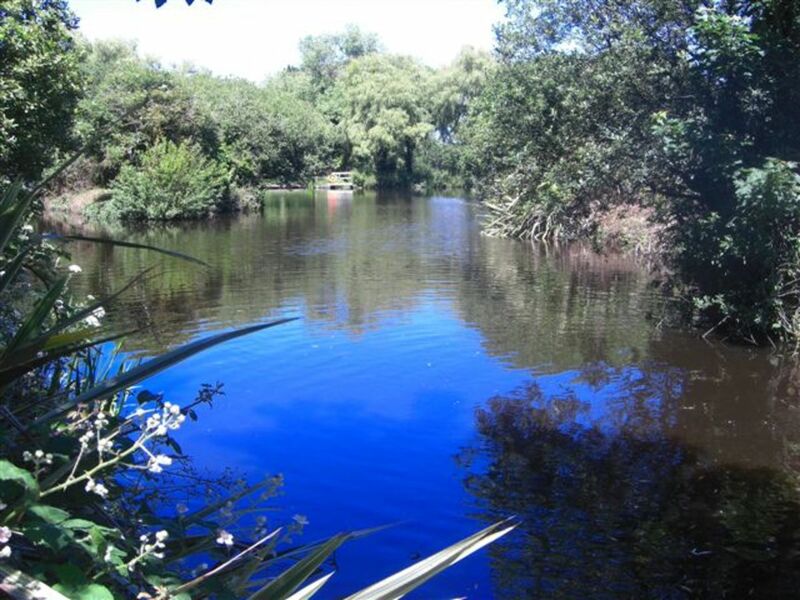 The moving water aerates and circulates in the pond, helping to oxygenate the water and to remove any trapped gases. 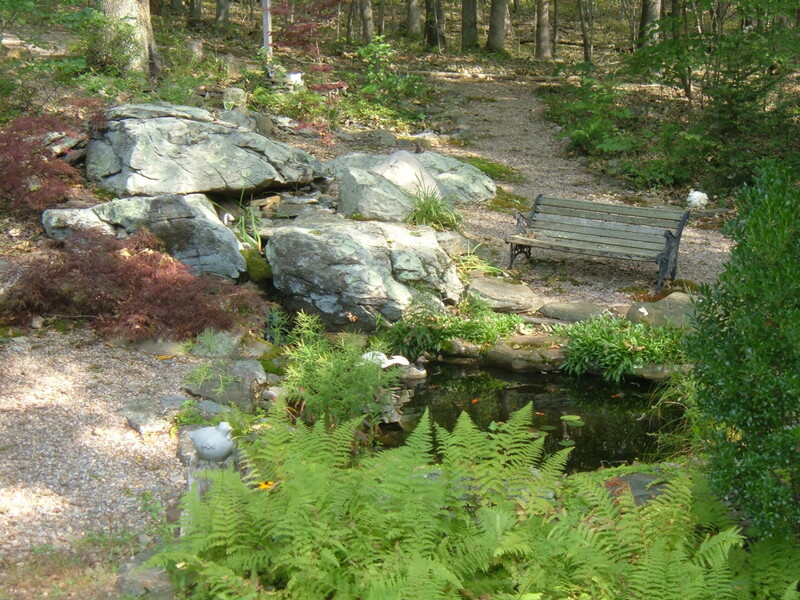 The small stream in our pond runs between several large granite boulders before spilling into the water below, and the cascading water from even our modest waterfall creates enough movement on the surface of the pond to keep a small section free from ice all winter. The splashing waterfall creates curtains of spray, which freeze in the cold weather. As the freezing spray builds up, it forms a thin wall of ice around the waterfall. It does not take long before the waterfall is encased under a delicate dome of ice. After a light snow covers the ice, the waterfall disappears from view but we can still hear the splashing sounds of the waterfall trickling down into the pond. 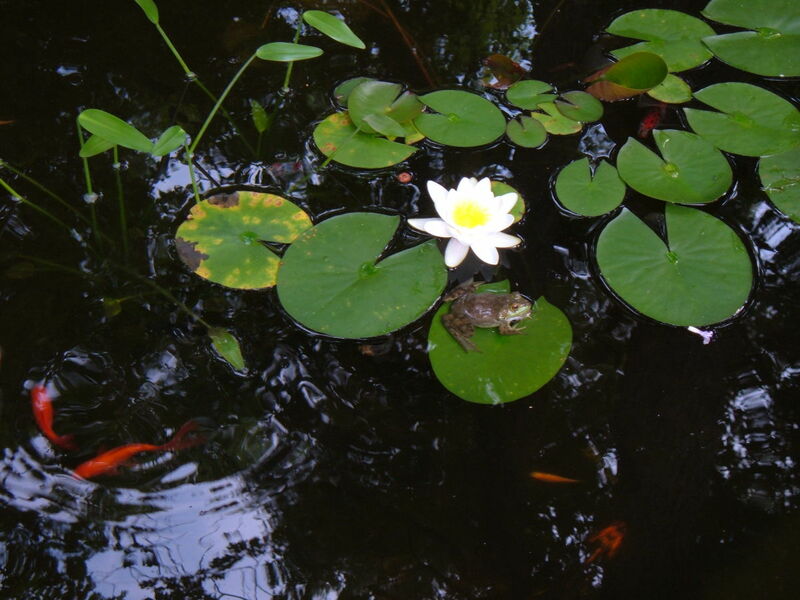 Do You Have to Winterize Your Garden Pond? I don't have a pond -- at least, not yet! Do Not Break the Ice! Pounding on the frozen surface of the pond can hurt the fish below. It's like being trapped inside of a steel drum while someone pounds the outside with a hammer! The two previous photos were taken from approximately the same spot in the yard. 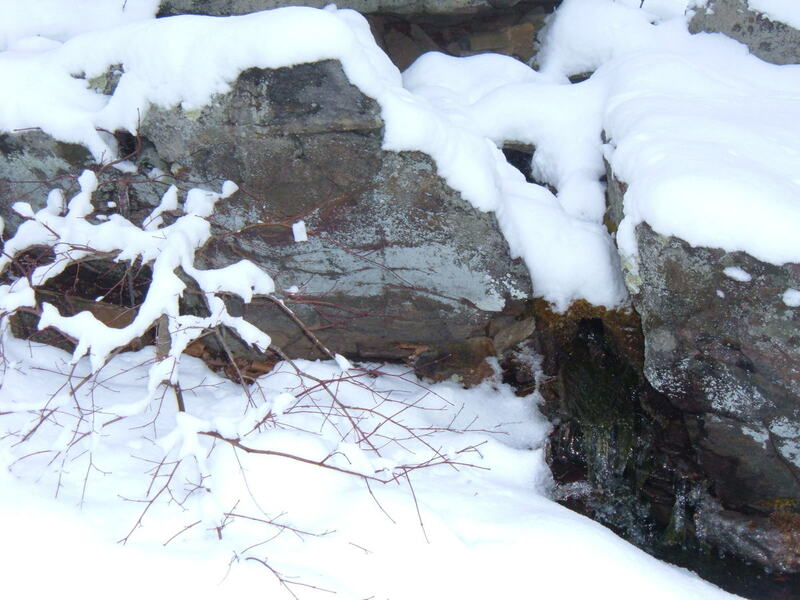 The top photo shows the pond in summer while the lower photo captures the snow covered stream and trickling waterfall. The stream flows down the crevice between the two chunks of ledge and behind the Janpanese maple, then splashes down into the pond. As the seasons change, the views and focal points also change, adding interest to the garden. Though snow and ice covers most of the pond, winter still offers its own unique appeal and attraction. Sometimes, fish can be seen swimming slowly under a thin layer of ice, their shapes and movements distorted by the refractions of sunlight through the ice. Birds, squirrels and deer visit to drink from the stream feeding the waterfall, leaving their trail of footprints in the snow. The splashing spray from the waterfall freezes, forming tunnels of ice for the flowing water. And through the quiet of a winter morning, you can still hear the sound of your water garden. 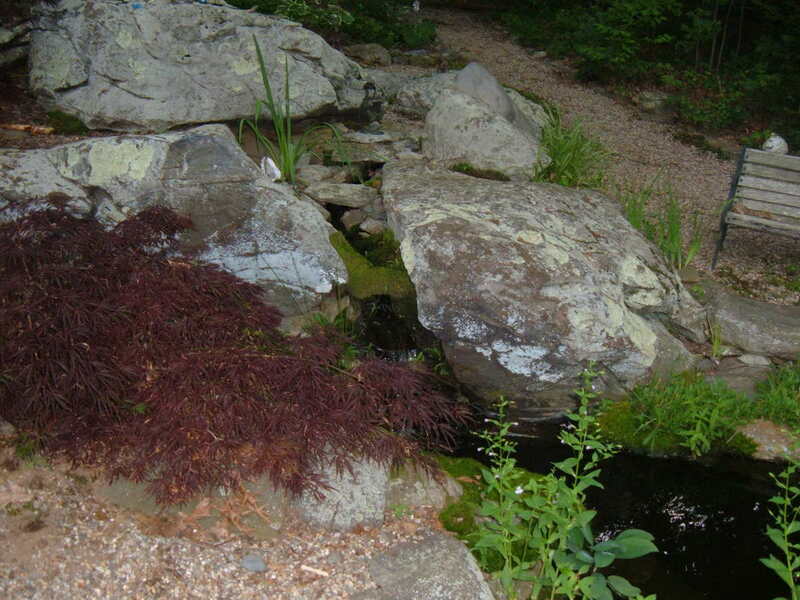 The large rock outcroppings in our backyard provide a dramatic backdrop for a little stream leading down to a waterfall, and then cascading into a small pond dug out between the rocks and contained by a cinder block retaining wall. Ah, Spring Is Finally Here! Your back yard is such a beautiful relaxing haven and I always learn so much on your articles. 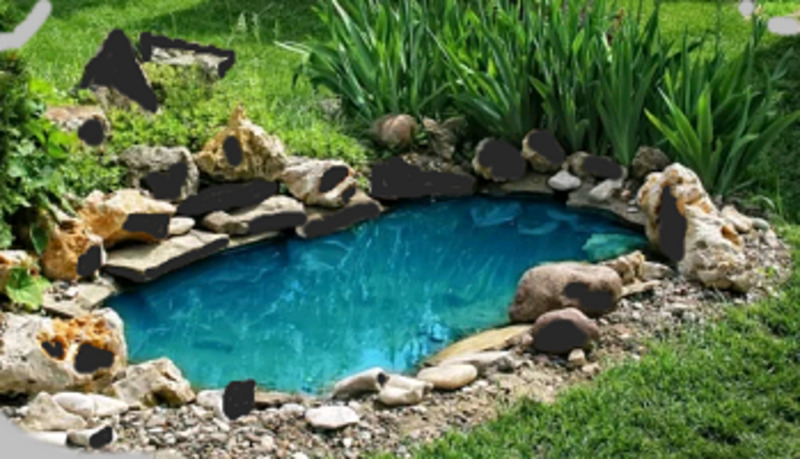 I had no idea how to winterize a pond (but I do now!). Thanks for your advice about how to winterize a water garden I think it will really help me. I so enjoyed your lens. I've just started a pond from a hillside spring in a mountain bog or seep. 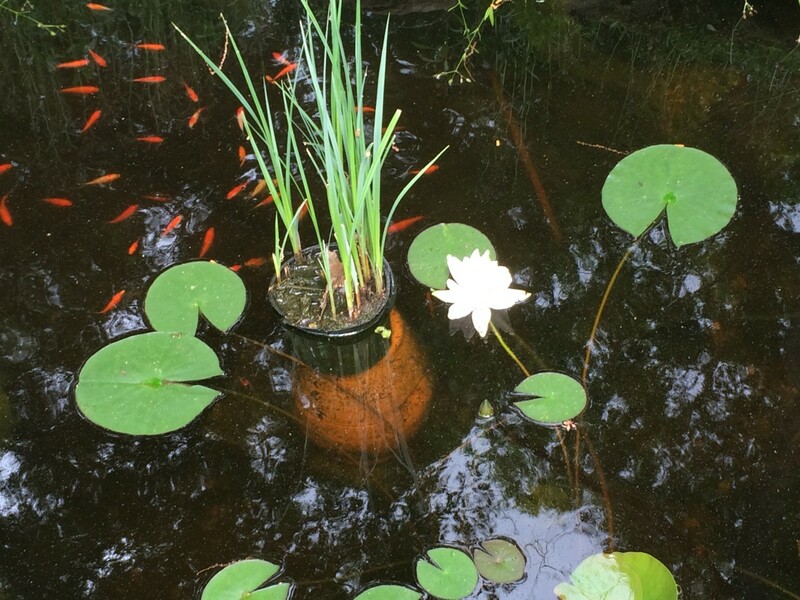 I published a lens today about the progress of my pond. Your information has ALREADY been used...even though clearing the leaves out may be better saved for November in my area! Thank you! Excellent tips and advice. Well covered. 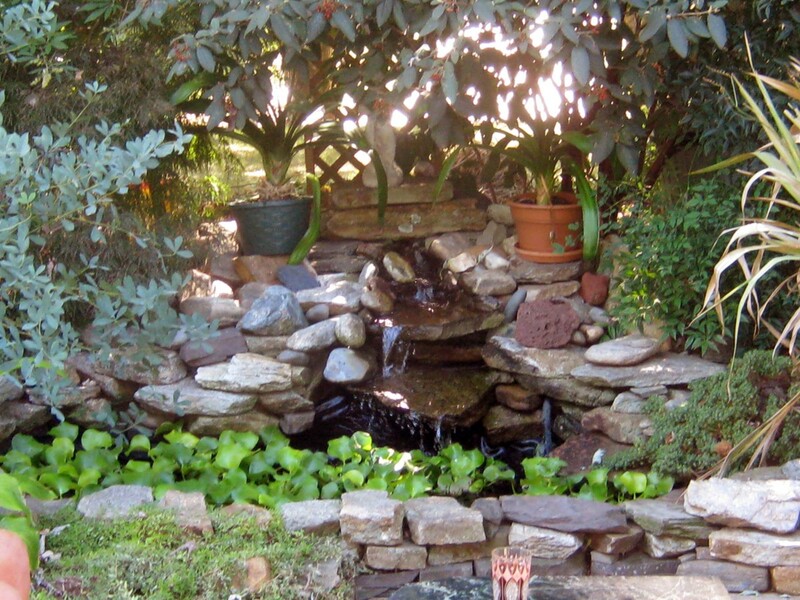 Although I don't have a garden pond yet, it is still on my list of things I want to do, and when I get around to it, I will know where to go for great information. I always wondered how the fish survive in a garden pond; now I know. great lens! 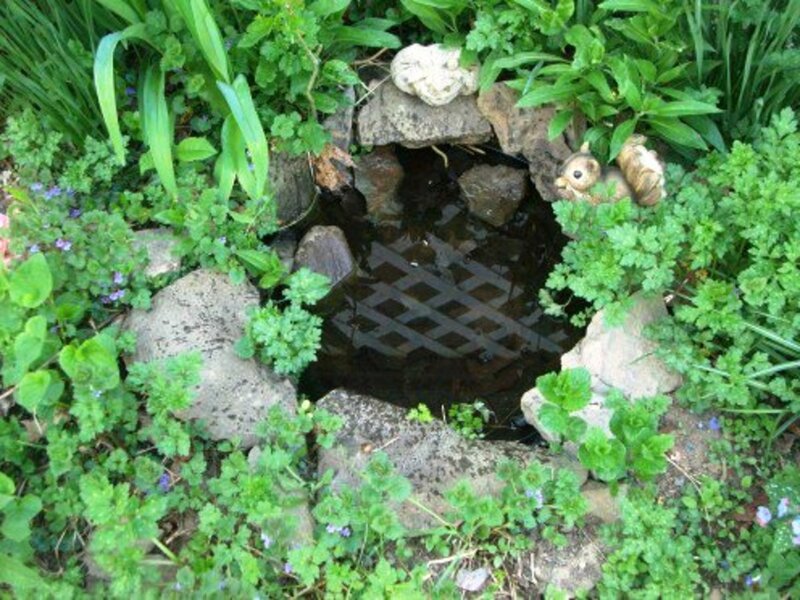 I have always shyed away from keeping a coy pond for fear of the winter months. 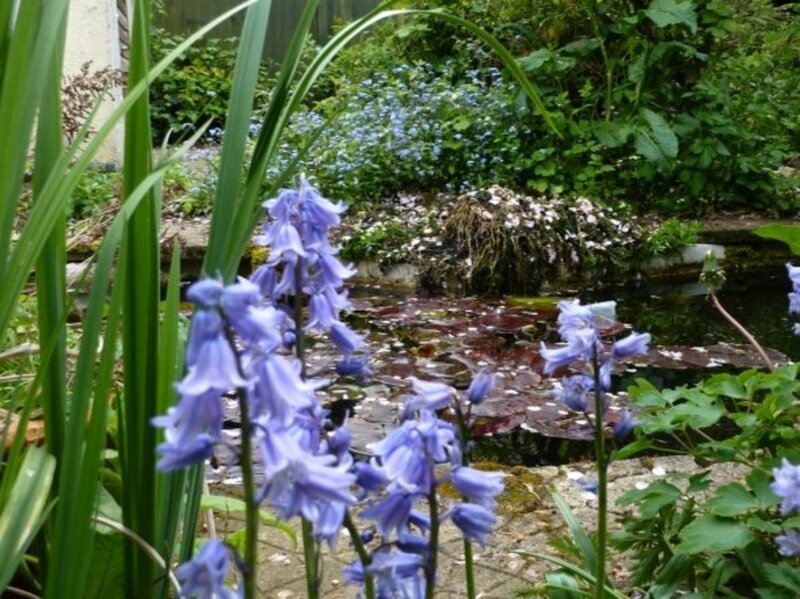 One day, perhaps, I'll have a garden pond. And I'll certainly need to know how to winterize my pond. Thanks for the helpful info! Nice lense! I built a small pond last year and after several month developed an algae problem. I bought Crystal Blue copper sulfate and was able to get it under control. Anyway, I just thought some of the readers here would like to know in case they encounter the same issue.Thanks! I am in the process of building a pond now. I don't have much usable space and no electrical access in the area it's being built but that's just minor details ment to be worked around. I have to be a drop more creative. I'll be using a lot of natural filtering with plants. I'll be simulating the waterfall with rock, mirror and glass.